Are you tired of taking courses that don’t provide practical, clinically-relevant information that actually works? Enter Your Email Below to Watch a Sample Course Video! Functional medicine doesn’t have to be difficult when you learn clinical strategies and a proper approach for every patient you see. The Hedberg Institute will teach you how to properly assess chronically-ill patients and how to get them well quickly and effectively. 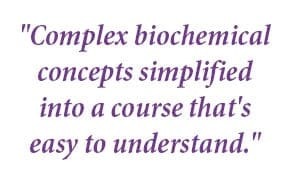 Our courses won’t bog you down in complex biochemistry, only practical information that you can actually use in your practice. Achieve the highest level of clinical success. Help patients who no one else can help. Our Functional Medicine Master course is the perfect course for both the beginning functional medicine practitioner and also the advanced practitioner who wants all the complexities of functional medicine simplified into one course. Dr. Hedberg has taken the most complex biochemical concepts and simplified them into course material that is easy to understand, implement in your practice and achieve the highest level of clinical success with your patients. Additional courses are coming soon.